Your Experts in Agriculture... and Beyond! Boyd’s Electrical Service, Inc specializes in the design, construction, and maintenance of electrical and automation systems for agricultural industry, municipalities, general industry and government. 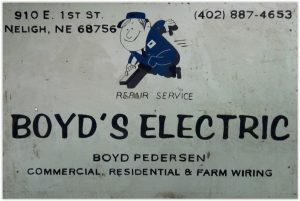 Boyd’s Electrical Service, Inc was started in 1985, by Boyd and Carolyn Pedersen of Neligh, Nebraska. What began as a one man shop in 1985, has grown to multiple locations and a full time staff of over 20 employees, with additional employees during the summer months. Boyd and Carolyn continue to manage the overall operation of the business, ensuring quality and value for our customers, and the safety and satisfaction of our employees. With the northern half of Nebraska covered by the Clearwater shop, the company expanded south in 2009, adding a location at Grand Island, Nebraska. This location is operated by Boyd and Carolyn’s oldest son Mitch, and serves as the base for southern operations. In 2014, the company expanded further and a new business was created. Boyd’s Network Solutions serves the IT networking, telephone, and video needs of customers throughout Nebraska.